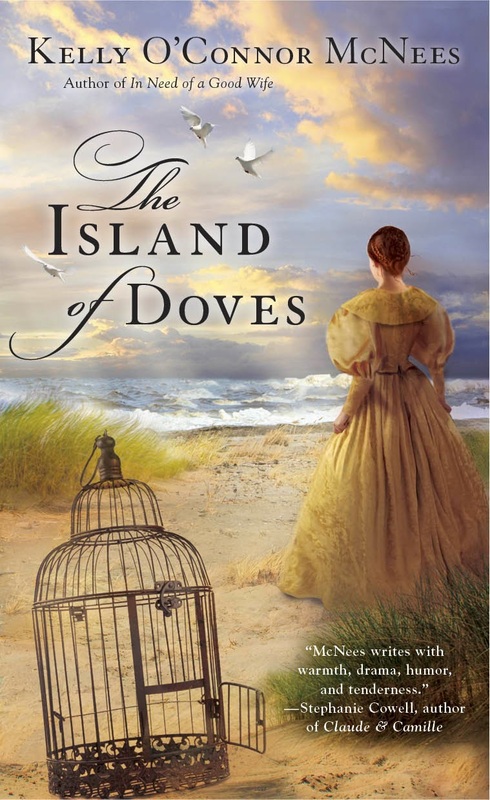 Do not let the demure painting on the cover fool you--Kelly O'Connor McNees' THE ISLAND OF DOVES packs quite a punch! I absolutely LOVE this novel. It is one of those rare books that can't put down and whose ending leaves you in pain pining for more. THE ISLAND OF DOVES is set in 19th Century America, when the grand houses of the wealthy, newly-established Americans stood in a fascinating but fading co-existence with the camps of the Native American peoples. Susannah Fraser belongs to the first group, living in one of Buffalo's stateliest mansions amongst her fine china, jewels, servants, and a husband who spares her no love or kindness. Following a particularly violent encounter with her husband, a Catholic sister offers Susannah a means of escape. She boards a steamboat across lake Huron toward Mackinac island and toward Magdaleine Fonteneau, a woman hell-bent on securing Susannah's freedom for her own reasons. Magdaleine is a truly compelling character and based loosely on one of the most successful fur-traders in the Northwest Territory--Magdaleine Laframboise. McNees' Magdaleine is a wealthy fur trader too, widowed while pregnant with her first child and forced to take the reigns of her late husband's business. She is of direct French and Native American descent, like most of Mackinac's inhabitants, and she can row a boat or tap a tree as well as any man. She also volunteers her time selflessly to teach local girls how to read the catechism. But she struggles with showing any love or maternal instinct toward her now-adult son, and also coming to terms with the tragic death of her two sisters. These two women--vastly unalike--manage to save each other. They weather many storms, including the possibility that Susannah's husband is on the hunt for her, not always with grace, but with a hearty tenacity that is the hallmark of pioneer women. I found this inspiring! By no means do men play second fiddle, but it is clear that the women in THE ISLAND OF DOVES can take care of themselves and each other. This expertly-realized pioneer spirit, along with the most natural of dialogue (a difficult task for any author) and a plot that moves at a perfectly addicting pace, makes THE ISLAND OF DOVES a must-read in my book. I truly hope that Kelly O'Connor McNees will be writing a sequel so that we can all find out more of what happens to Susannah, Magdaleine and the crew. In the meanwhile, I've been inspired to do a bit of historical research into this era in American history--thanks for the inspiration, Kelly! *WIN YOUR OWN COPY! Simply comment below and I will select a winner at random. The contest will end on Monday, April 14th at 11:59pm. Good luck! Berkley provided me with a copy of this book for review and giveaway. Kind of cool how she finds herself and has the help of another woman. A woman of God can do many things. :) The hardships she goes through and Faith to keep to get through things in general would be an interesting read. I wonder if her faith grows because of this. Lisa, i stumbled upon this....when do you have time to read?! Although not a Rockland mother, i am a Rockland father and have a wife and a few sisters and sister in laws who would enjoy this book!